Spray 4- to 5-quart slow cooker with cooking spray. 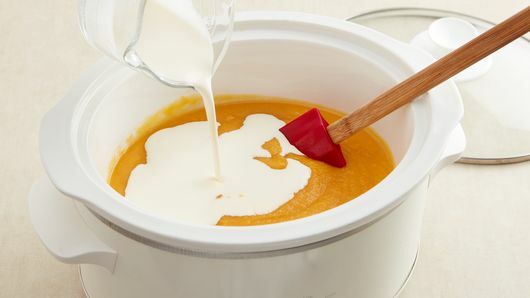 Add all ingredients except whipping cream. Pour half of the squash mixture into blender. Cool 5 minutes. Cover; blend until smooth. Pour into 8-cup measuring cup or large heatproof bowl. Repeat with remaining squash mixture. Return squash mixture to slow cooker. Stir in whipping cream. Cover; cook on High heat setting about 5 minutes or until heated through. For a flavor twist, stir in 1/2 teaspoon ground cinnamon, chopped fresh thyme or curry powder. 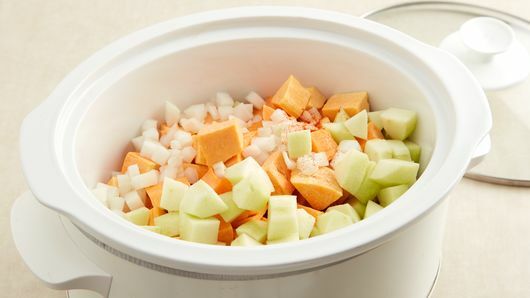 Purchase peeled, precut butternut squash in the produce aisle of your favorite grocery store. Sprinkle a little cayenne pepper over top of the soup as a garnish, if desired. When blending hot liquids, it is very important that you not seal the blender, or you could risk it exploding. Remove the center portion of the blender lid, and loosely cover with a kitchen towel instead. Not sure how to peel and cut a butternut squash before making butternut squash soup? The task can be a little daunting if you’ve never done it before. But it doesn’t have to be! Just make sure you have a large, sharp kitchen knife and a sharp vegetable peeler. Small, dull knives will make this task much more difficult and also quite dangerous! First, cut off the ends of the squash; this way, it will be easier to stabilize when you’re peeling. Peel the whole squash (though the skin is technically edible, you won’t want it in your soup), cut it in half and scoop out the seeds with a spoon. Next, cut the squash into rings, and then into individual cubes. Don’t get too hung up on cube size—as long as they are all relatively uniform and roughly 1-inch cubes, they are ready for cooking. Don’t feel like doing all of this work? Don’t sweat it. A lot of grocery stores carry packages of butternut squash that’s already peeled and cubed. 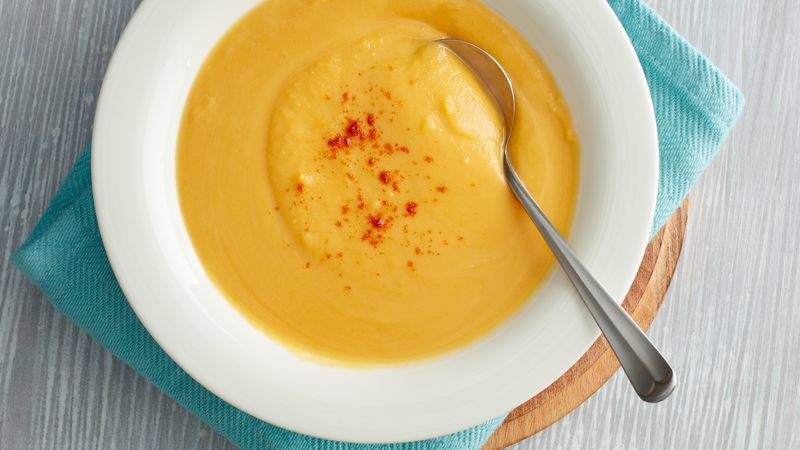 After you try this recipe, slow-cooker butternut squash soup will become one of your new favorite fall dishes. Get more squash soup recipes here and read this article to stay inspired all throughout soup season.